Drum Corps International headed to two Indiana State School Music Association (ISSMA) marching band regionals this past Saturday in Lafayette and Greenwood, Ind. 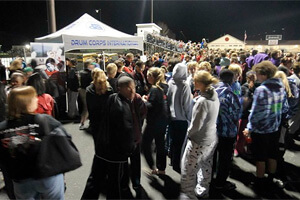 Those stopping by the DCI fan tents at those events had the opportunity to check out information about the 2011 drum corps audition season as well as the ISSMA Fan Network. The new online video platform, which is powered by DCI, will give marching band enthusiasts subscription access to performances from the upcoming ISSMA Semi-State and State Finals competitions. Learn more about the ISSMA Fan Network. View photos from the Lafayette Regional on Facebook. View photos from the Center Grove Regional on Facebook.